FAYETTEVILLE, Ark. – University of Arkansas students who have enrolled for the fall semester may now purchase their 2015-16 Student Access Pass. By purchasing the Access Pass, students receive admission to home football and men’s basketball games plus the official Trough shirt for $85 . 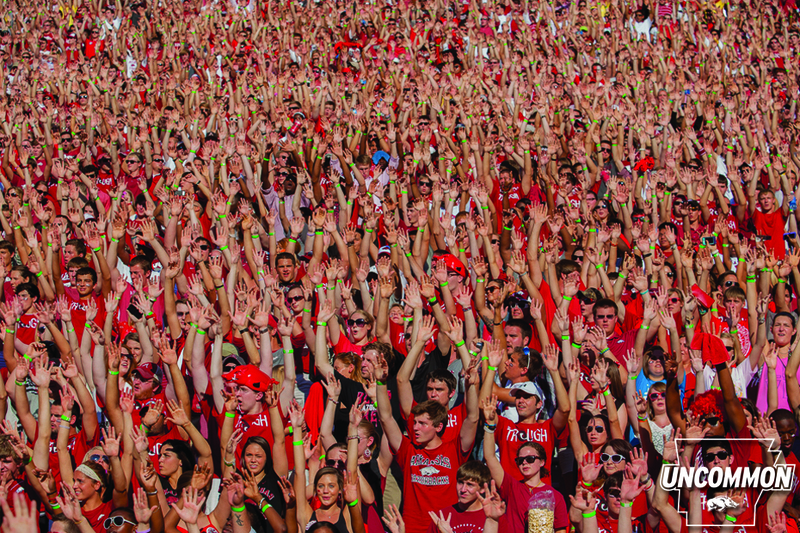 Students can receive full instructions about the pass and make their purchase directly by logging on to https://arkansasrazorbacks.com/studenttickets/. The football program’s game in Little Rock at War Memorial Stadium on Sept. 12 against Toledo is included with the Access Pass, but only for the first 2,000 students who pick up their voucher. Only students with their Access Pass will be able to pick up their Little Rock football voucher at the Razorback Ticket Center from 9 a.m.- 4 p.m. beginning on Tuesday, Sept. 8. Student tickets for the Southwest Classic in Arlington, Texas, between Arkansas and Texas A&M are not included with the Student Access Pass, but will be offered on a priority basis for purchase to access pass members. A minimum of 3,500 student tickets will be allocated for the Southwest Classic. Student tickets for the Southwest Classic are $50. Students will also have the opportunity to become Collegiate Members of the Razorback Foundation when purchasing the access pass. The $15 membership enhances the access pass by providing each member with an exclusive Collegiate Member t-shirt, membership card, plus invitations to exclusive events with Razorback Head Coaches, early admission to home football and basketball games in addition to other select events, and priority ticket access for the Southwest Classic football game in Dallas, plus more. In addition, students with a valid student ID may gain free admission to all regular season home events including baseball, women’s basketball, gymnastics, soccer, softball, swimming and diving, tennis, track and field and volleyball. For additional questions regarding student tickets click here or contact the Razorback Ticket Center at 1-800-982-HOGS (4647).